Just a reminder that our next meeting is Monday June 5th, 6-8pm at Camrose United Church. Come on out, meet some great folks and find out all the exciting things we have planned for the coming months! Community Barbeque on June 24! Introductions and Sharing: How are you doing this week? • There are six Clobber Texts that are generally used to support homophobia. Liz highlighted a few. o Note that judgement is better left to God: “my orientation/identity is between me and God”. • Use discretion when opting to engage as it can risk escalation of the other person’s reaction. • Liz added that the Bible is not a singular text, but a library written over many years. Biblical study is essential when selecting specific passages to make specific points. • In the end, everyone agreed that the primary message of the Bible is one of love. Jaywalker’s Jamboree on June 2 and 3: Wayne provided an update. • The Chamber of Commerce has now disallowed our face-painting fundraiser as there are other face-painters who have ‘invested lots of money’ and they now have a limit as to numbers of face-painters. • Alternative: a children’s fishing pool, with prizes. • Amber has supplies for fishing pool as well as the booth, including a new tent and sandwich board. • Everyone agreed to continue with Jaywalkers and offer the fishing pool. We will also have buttons and rainbow flags, which Carl has purchased. o Pride members will drop off cash donations (as affordable for them) to Gus at House of Hair Design. o Amber and Jen will take care of the fishing pool, including purchasing the supplies. o Jen will email reminders re donations and the volunteer schedule. Another All-Ages Dance in the Fall: There is still interest in organizing this, although it was a bit of work and fairly costly. Expenses are not in this year’s budget, but perhaps Jaywalkers, BBQ and other donations may help. We would not have access to the same DJ, who was paid an honorarium but also donated a lot of time, so would need an alternative DJ. We would probably ask Thomas to MC and Robin Banks to perform. Re-visit at June meeting. • Home Hardware BBQ will be delivered. • Jonathan won’t be here to help BBQ; Amber’s father may be able to help. • Rebecca is helping/donating food. • Will purchase burgers from M & M Meats as pre-cooked. • Carol may have more details to share at June meeting. • Other volunteer tasks will be shared at June meeting. • Folks on the float need to be secured: tethered or a rail? There are hooks on the flatbed. • Discussed design of float; tree with rainbows hanging from branches, and rainbow panels along the bottom. 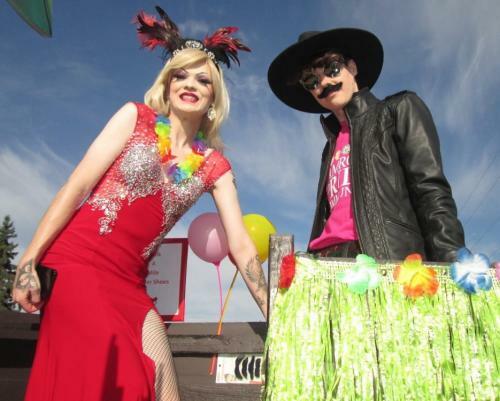 • Edmonton Pride Parade: Individual wavers not needed this year. Camrose Pride members who want to walk with the Altview float send names to Altview via Jen for inclusion in the group waver. o Email Jen if you want to walk – fairly soon as the parade is June 10.
o Jen will then connect with Michael/Altview. Adjournment and Next Meeting: The meeting adjourned at 7:50. Next meeting is June 5, 6 pm, United Church.